Ruth Murphy, Chief Counsel Business and Public Sector in BT presents the Chemical, Physical and Mathematical Senior Individual 1st place award to Emmett Brolly, Loreto College Coleraine County Londonderry for his project "Bead Fountains"
The winner of the 53rd BT Young Scientist & Technology Exhibition (BTYSTE) has been announced. 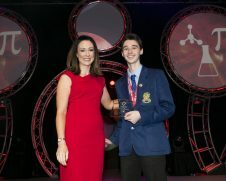 Shane Curran, aged 16, a 5th year student from Terenure College, Dublin 6, has taken home the top prize for his project entitled ‘qCrypt: The quantum-secure, encrypted, data storage solution with multijurisdictional quorum sharding technology’. The announcement was made in the BT Arena at Dublin’s RDS this evening. Shane competed in the senior section of the Technology category. 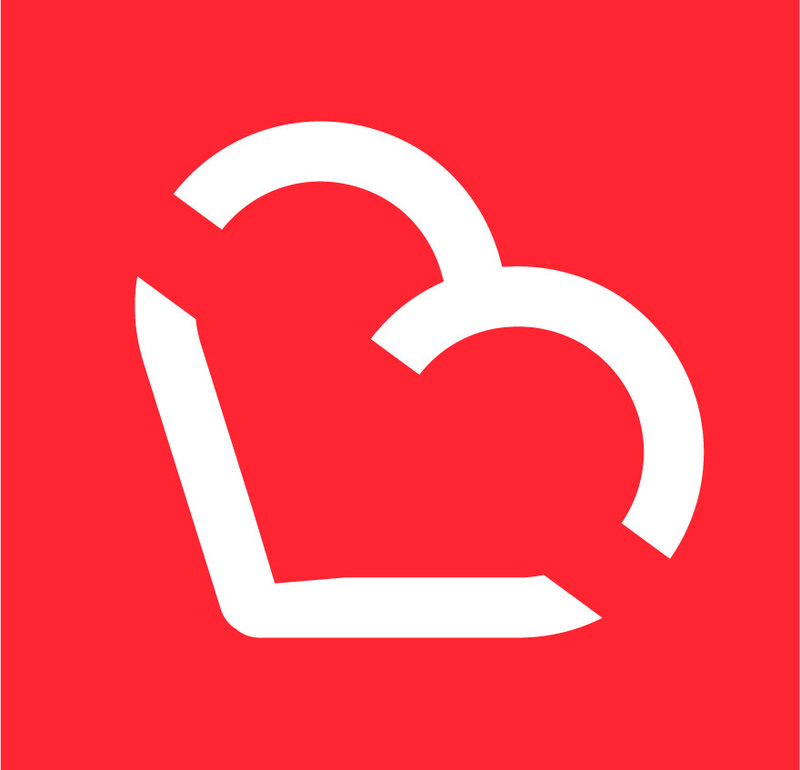 Northern Ireland students, who this week showcased their projects at the prestigious event, were also formally recognised at the awards ceremony. Beating off stiff competition, Loreto College Coleraine picked up the ‘MATRIX Best Northern Ireland School’ Award at the Exhibition. 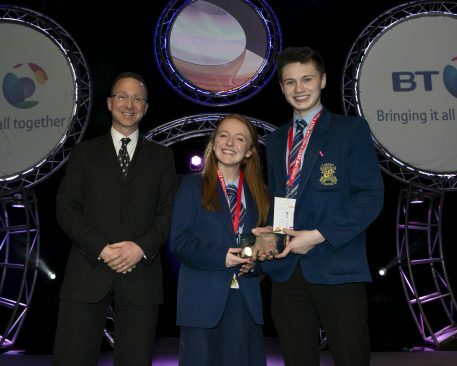 Dónal Close and Sian Donaghy from Loreto College Coleraine were also successfully awarded ‘BT – Northern Ireland Best Project’ for their entry ‘Phone Book Physics’ which was entered in the Chemical, Physical and Mathematical Sciences category at intermediate level. They were also highly commended within this category. Emmett Brolly from Loreto College Coleraine received 1st place Senior Individual in the Chemical, Physical and Mathematical Sciences category for his entry ‘Bead Fountains’. 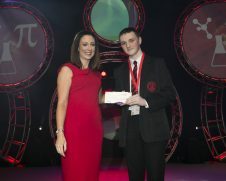 Alexander Baine from Ballyclare High School in Antrim picked up 2nd place for his project ‘Augmented Reality Sudoku Solver’ in the Chemical, Physical and Mathematical Sciences category at intermediate level. 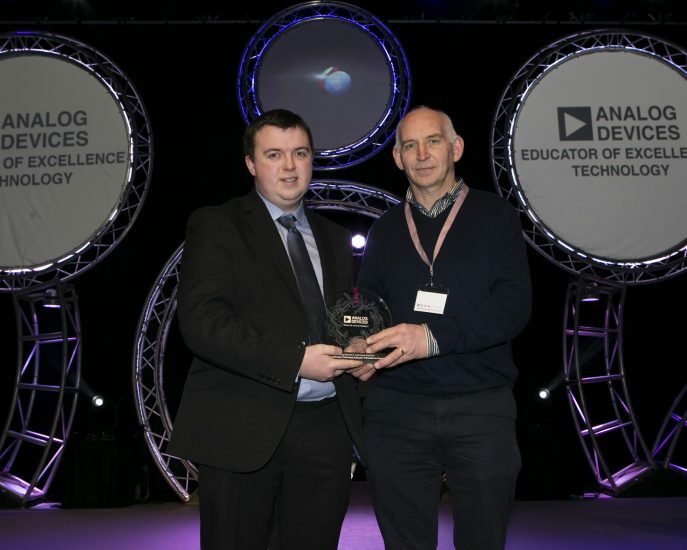 Sean Connolly, a teacher at St Killian’s College in Antrim, received the ‘Analog Educator of Excellence’ award. South Eastern Regional College Bangor Campus for their project ‘Investigating the link between habitat and the antibacterial effect of honey’ in the Senior Group section of the Biological and Ecological category. Over 1,100 students from 375 schools across the island of Ireland competed for the coveted title of ‘BT Young Scientist & Technologist of the Year 2017’. The BT Young Scientist & Technology Exhibition continues tomorrow, Saturday 14th January, and is open to the public from 09:30 a.m. – 17:30 p.m. Guests can expect to be wowed by a fantastic line-up of live shows including mentalist David Meade, renowned World of Robots and TITAN the Robot. For more information, visitors can download the free BT Young Scientist & Technology Exhibition app now. Alternatively, log onto www.btyoungscientist.com, check out http://www.facebook.com/BTYSTE, or follow on Twitter a thttp://twitter.com/btyste.